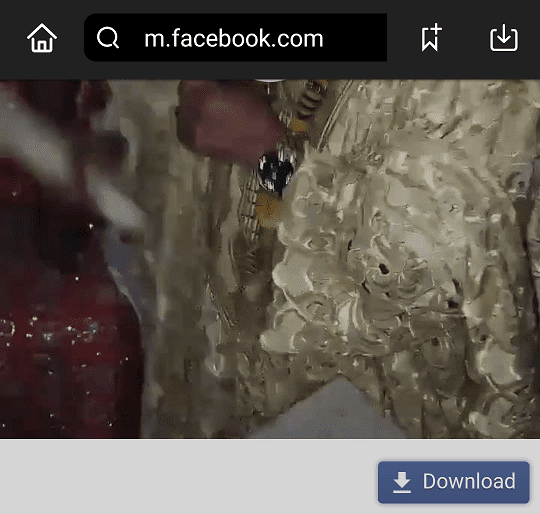 Snaptube is a free app available for Android that enables you easily download video and music from social media sites like Facebook, Instagram, Twitter, etc. Have you ever loved a video on Facebook or Instagram and wished you could save it to your smartphone for private consumption or sharing with your friends later? The Snaptube app might just be the app you have been looking for. We have been hearing a lot of stuff about this app for awhile now, so we decided to get it and try it out. We will be sharing our experience here. Snaptube is a mobile App for Android, but it is not available for download at the Google Play Store. You have to visit the website www.snaptubeapp.com to download the Snaptube APK to your Android device. 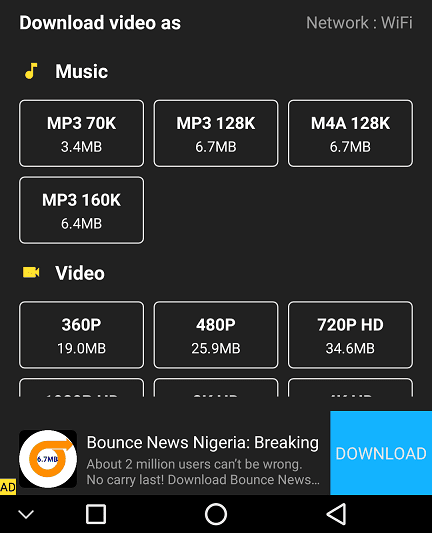 Just click on the download button to download the Snaptube APK. 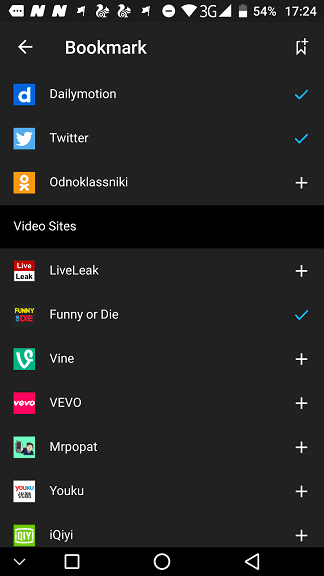 Snaptube can also be downloaded from other third party app stores like uptodown, APTOiDE, Softonic, etc. 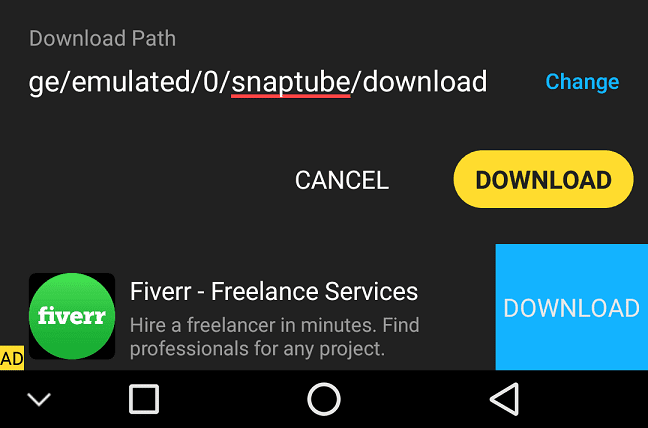 Because, Snaptube is not available on the Google Play Store, installing it to your Android phone can be a bit tricky, especially if you have never installed an Android app from a third party app store before. But not to worry, it is quite simple. Just one additional step. Go to Settings > Security and toggle on Unknown Sources. This simple procedure enables you install apps from Third party app stores. 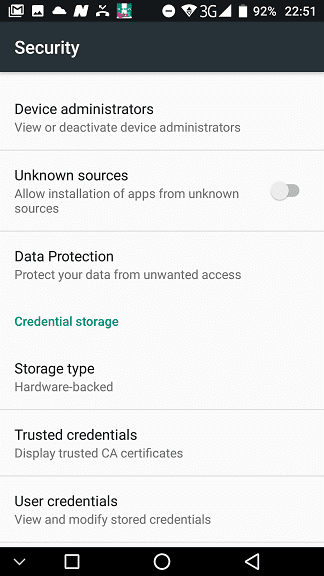 Ignore the Android security warning and tap OK. The download will begin. To install the app, just drag down the notification bar and click on the Snaptube APK to begin the installation. In just a couple of seconds, the app will be installed and you can start downloading videos and music free online. Once you have downloaded and installed the Snaptube app on your device, you will notice the clean UI. On top you will see shortcuts to popular social media sites like Facebook and Instagram and below you find a couple of trending videos. Essentially, you can think of Snaptube as a browser that enables you to easily download videos and music shared on social networking sites. Now let us take a look at some of the key features of Snaptube. Right from Snaptube’s homescreen, you will see loads of videos and music to watch. You will find the latest trending videos and music for your entertainment. 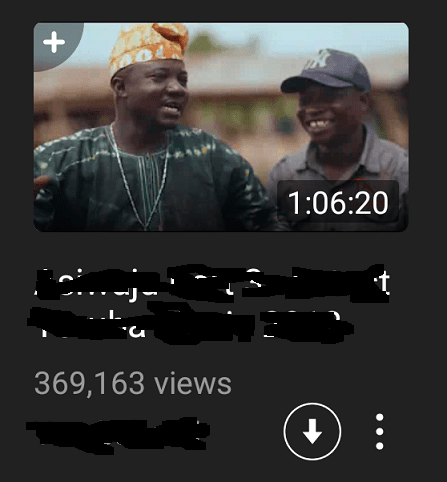 Just click on the thumbnail of a video to start watching it. With Snaptube, you have an option of watching a video directly by streaming it on the app or by downloading it to your device. 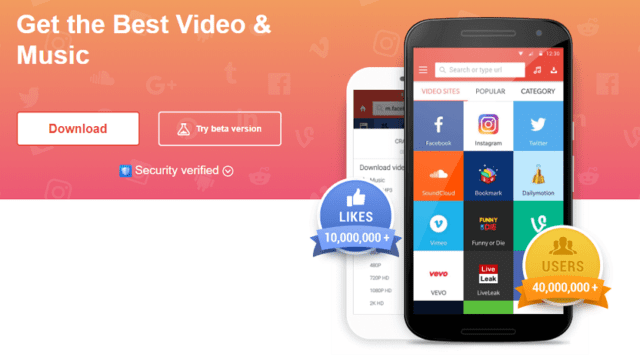 It is this ability to download videos to your device that is the true power of Snaptube and the secret behind its growing popularity. At the bottom right corner of the thumbnail of each video, you will see an icon of a downward pointing arrow enclosed in a circle. Simply tap this icon, to start the download. You not only download videos on the app, you can also download videos shared on social networking sites like Facebook, Instagram and Twitter. Just tap the icon of the social network to visit the mobile site. You will need to login to the social network. All videos on your timeline, will have a download button on the bottom right corner. Tapping this button begins the download. 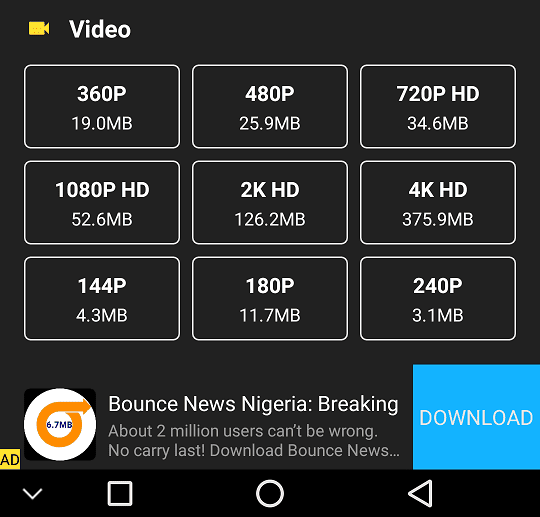 When you click the icon to download a Video, you are given multiple resolution options. You choose the one you like. You can choose a low resolution if you have limited data and want to save your data. Snaptube is light weight and fast. It is also easy to use. Without any guide, you will easily figure out how to use the app in no time. Downloading and using Snaptube is completely free. You do not need to pay a subscription to download or use the app. The content available on the app are also free, so you do not pay for downloading content. Since, the app is free, you could assume it is filled with annoying ads. However, this is not the case as I found out while I was testing out the app that the ads are not at all distracting. Ads are out of the way, giving you the freedom to enjoy your content. Downloading videos and music with Snaptube is easy. Just click the download icon or button, and in a couple of seconds, you could be watching videos natively on your device. There are two scenarios for video download on Snaptube. The first is downloading from the list of trending videos and the second is using the shortcut icon to browse specific social networking sites for videos. We will be covering both scenarios here. This approach is straight forward, just find a video either by scrolling through the list of trending videos or by searching for a video using the search bar. Once you see what you like, tap the download icon on the bottom right corner of the video’s thumbnail for the download to begin. You will be given an option to select the resolution you want to download the video in. The higher the resolution, the better the quality of the video, but the higher the data required to download the video. You will see the data required to download the video at each resolution. To save data download at a lower resolution. You can also download in mp3 audio format to save even more data. Tap on the button of the resolution you want the video in. I will pick 720p HD Video, which is just 36.4MB for this test. In the new page that opens, tap the yellow download button to start the download. Your downloaded videos will be stored in the Snaptube folder in the Gallery. Have you ever seen a funny video on Facebook, Instagram, or Twitter and wishing you could download it on your mobile phone for personal consumption or to share with your friends later. Snaptube is one app that fulfills your wish. Just click on the icon of the social networking site on the Snaptube homescreen or Video sites page. Then login to the social site using the built-in browser in the app. Browse to find the video you want to download. Videos will have a download button on their bottom right corner. Click on the button to get to the download page where you will be given options on format. MP4 seems to be the only option here and there are no options for choosing resolutions like in the earlier example. Tap the format you want and click on yellow download button on the page that emerges. That’s it. You can now check the Snaptube folder in Gallery for downloaded videos. 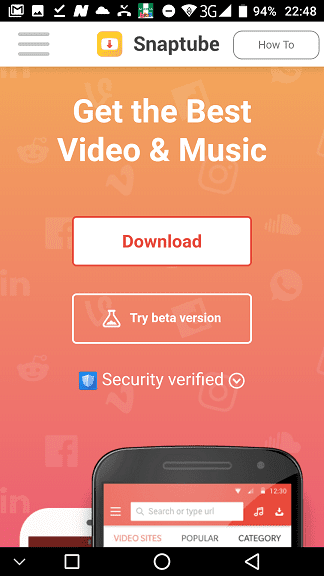 In order to download videos using Snaptube, you have to access the mobile website of the social networking site with the built-in browser in the Snaptube app. However, you cannot enter the URL of the site directly rather you access them through their shortcuts (or speed dials). A few sites are featured on the homescreen with more on the Video Sites page. You can also add more sites from the bookmark page by clicking on the More button in the Video Sites page. 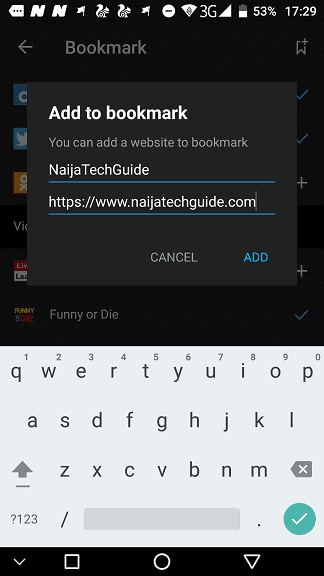 To add a site to bookmark, click on the add to bookmark icon (top right corner of the bookmark page) and enter the name and the URL of the site you wish to add to bookmark and tap ADD. 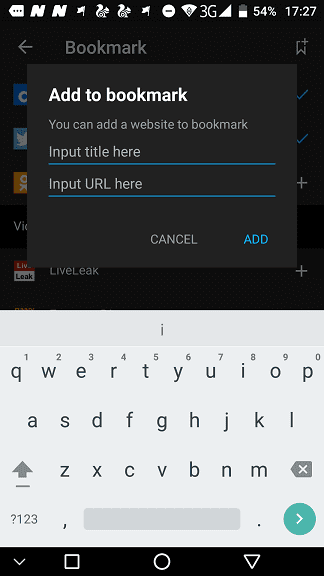 To create a shortcut (or speed-dial) for a bookmark entry in the Video Sites page, tap on the plus sign (+). The first two rows of eight shortcuts appear on the homescreen. You can change the position of any shortcut by dragging it and dropping it to any position on the screen. This action will also enable you control which shortcuts appear on the homscreen by making sure they are placed in the first 2 rows.